This is not going to become a Julie & Julia kind of blog, but I figured I would share with you my success and failures cooking my dinner this week. I found this recipe at Eating Well. Although I loved the recipe and thought the paprika and parsley were perfect compliments to the shrimp, I should have followed the advice of a reader who said to double the recipe for the sauce. I found that there wasn’t enough to pour on top of the entree. Another complaint I have is the site says meal preparation will take 30 minutes. I am the type of person who chops and prepares all of her ingredients before getting started and with all of the fresh seasonings that alone took me about 30 mins. So I would recommend having those ready in advance or using prepared versions of the parsley and 1/4 cup of minced garlic. That’s a lot of mincing. Additionally, I felt like the recipe called for an overwhelming amount of parsley, so I just eyed that, and I only used one can of cannellini beans. 1. Bring 1 inch of water to a boil in a large saucepan. 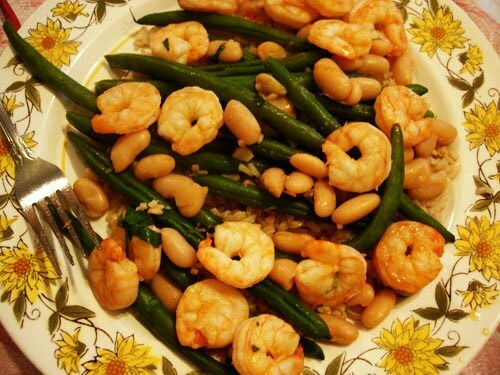 Put green beans in a steamer basket, place in the pan, cover and steam until tender-crisp, 4 to 6 minutes. 2. Meanwhile, heat oil in a large skillet over medium-high heat. Add garlic and paprika and cook, stirring constantly, until just fragrant but not browned, about 20 seconds. Add shrimp and cook until pink and opaque, about 2 minutes per side. Stir in beans, vinegar and salt; cook, stirring occasionally, until heated through, about 2 minutes. Stir in 1/4 cup parsley. 3. Divide the green beans among 6 plates. 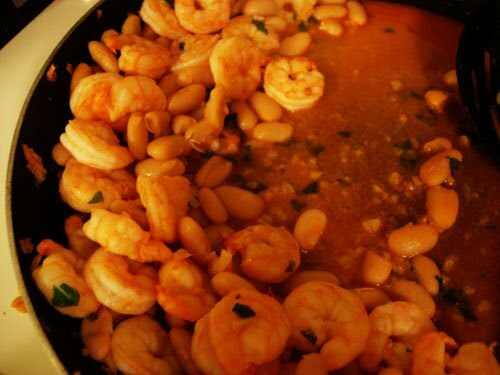 Top with the shrimp mixture. Sprinkle with pepper and the remaining 1/4 cup parsley. Per serving: 245 calories; 8 g fat (1 g sat, 6 g mono); 115 mg cholesterol; 26 g carbohydrates; 0 g added sugars; 23 g protein; 8 g fiber; 596 mg sodium; 855 mg potassium. This one, I really got to try. I love shrimps and I love spicy food. So I may even add more paprika here, lol! It actually looks delicious. I usually like my shrimp either grilled or in salads, but this one is really appealing to me. I will definitely try it. Thanks for sharing this one.